CSIRO is developing FLECK™ Nano – a miniature version of the highly successful FLECK sensor nodes that independently record environmental conditions then cooperate with each other to wirelessly send their data to a collection point. Two students working with CSIRO's vacation scholarship scheme have been applying their research skills to bringing FLECK Nanos indoors. Doing so means things like temperature and power use can be monitored at a very refined level and small objects can be tracked unobtrusively. “The idea of pervasive computing has been touted for some time, but is not yet available for everyday office items,” CSIRO ICT Centre researcher, Phil Valencia, says. Two university students have spent their summer holidays working with Mr Valencia as part of CSIRO’s vacation scholarship scheme. 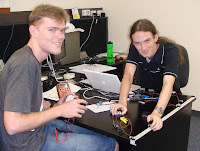 A software engineering student at the Australian National University, David Kooymans, is working on reducing the energy demands of mobile FLECK Nanos. “They communicate with a node in a known location using radio waves,” Mr Kooymans says. An electrical engineering student at the University of Queensland, Blake Newman, is looking for ways FLECK Nanos could ‘scavenge’ energy from the environment. “You don’t want to be changing batteries in thousands of little devices so we are designing energy scavenging circuitry that will make power from whatever source it can,” Mr Valencia says.